My jacket is wet. My shoes are wet also. I am in a bus on my way to an orphanage. We had to walk almost a mile and cross the border to Tijuana where the orphanage is. I am listening to music wearing my headphones because I cannot stand Mexican (accordion or Banda) music and the noises the bus makes my ears hurt. I am typing this blog on my phone like almost all my blogs. Everybody seems excited to get to the orphanage. People are talking and here I am sitting alone in the seat. I might look like I am antisocial. Did I paint a picture for you? I woke up with a bleh attitude but right now I am happy! I am smiling! I am excited to spend my day off in an orphanage. I have made some friends I really care about. There is a reason why I am still breathing. I know there is stuff for me to do here on earth. Today, we are going to my favorite orphanage. I get to love this little one that has my heart!!! A 9 month baby who I love kissing, feeding, hugging, making him laugh and even change his diaper!! And the most important thing about my life is that I love Jesus Christ and He loves me back! I have a direct connection with Him. I talk to Him every day… all day! He talks to me! I try to obey His commands as much as I can! AND I CAN HONESTLY SAY THAT I WISH I COULD BE HOME WITH HIM TODAY!!! No, I am not being suicidal or anything like that… I just know what I was made for and what my future looks like because of what Jesus did in a cross for me. I don’t want anything right now! I don’t need anything else right now! I know I write about Praying While Waiting. I know I write about crushes. I know it looks like I am in constant look out for my husband. BUT I am not. Did you know that most of my stories are just inspired by people I minister to? Did you know that some of the blogs I post here were written a LONG time ago? Did you know that I had to buy more iCloud space because the amount of writings I have in my phone? Do I fall for guys? Am I talking to someone right now? Yeah… I am currently talking to a guy. Do I see a future? Why am I still talking to him? Because for some odd reason he is in my life! Am I specting to make an impact in his life? All I want right now is a burrito! Ah a surf and turf burrito sounds pretty amazing!! Seriously, I am getting hungry! Do I want a serious relationship? The reason why I don’t know is because I cannot afford to fall in love with a dream. I cannot fall in love with someone who only lives in my head. I’ve done that way too many times. I can’t keep fantasizing on something that is just one way. Something where there is love going out from me but no love coming in my way. Now, I want to fall in love with someone imperfect. I wanna fall in love with someone that is real! And this time, I want to be the one that’s being pursued. I want him to make the first move. Pray for me! It’s so difficult for me to really just stay put and let the guy make the moves. But for once… I want something different. 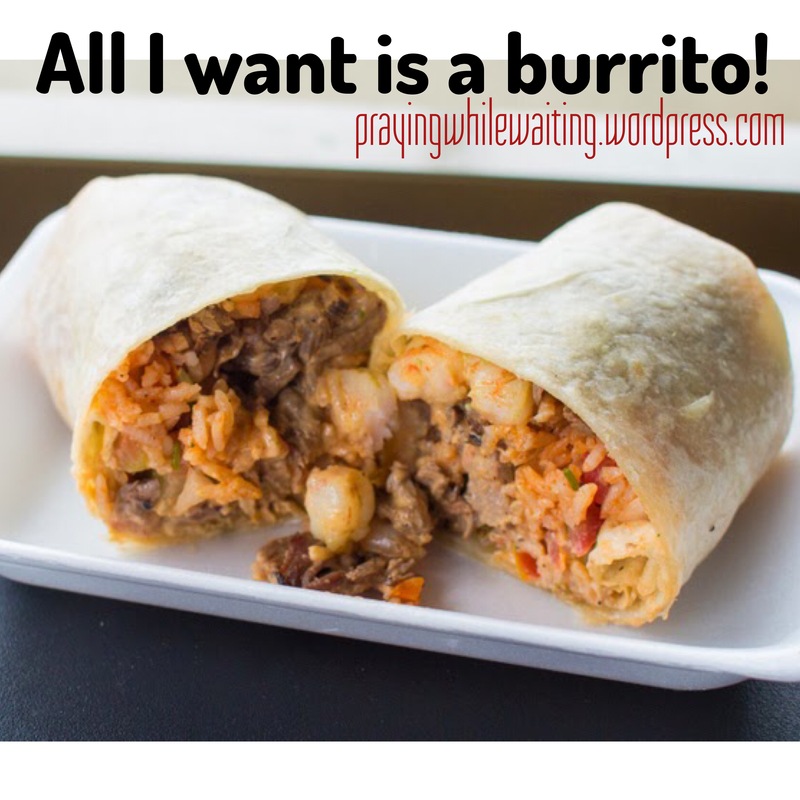 I want someone to want me the way I want a burrito right now!!! !